Proudly anchoring the west end of the tony Pearl District, it has grown and flourished along with Portland: when Walter Powell opened his shop in 1971, this was Skid Row. Now this landmark is considered the biggest, best and greatest bookstore in the world. It is not difficult to understand this global appeal. "I think the size is a big part of the attraction: a whole city of books at your fingertips!" says Peyton Marshall, a local author and musician who, like most of the city's word-wise denizens, has spent more than a few hours inside the store in a single day. "And some people simply like the feeling of being surrounded by books," she adds. Portland has also been called home by many other vibrant literary voices, from Beverly Cleary (author of the Ramona Quimby children's books) to Chuck Palahniuk (author of the novel-turned-movie Fight Club), so it is no surprise that a unique bookstore with the same spirit would blossom in the City of Roses. Its stock, size and staff back up its worldwide reputation, and book lovers everywhere have Walter and his son, Michael Powell, to thank. Bucking tradition, it was Walter who followed his son into the bookselling business. The birth of Powell's Books can be traced to 1970 when, backed in part by Nobel laureate Saul Bellow, Michael Powell leased a small bookstore in Chicago. After traveling to spend a fun and profit-filled summer helping his son, Walter returned to Portland to establish what within a decade would grow into a literary emporium. The key to their success at the new location was an unorthodox business model: selling used books alongside new ones. This novel approach paid off handsomely, leading the Wall Street Journal to describe the business as "one of the most innovative and creative enterprises in the country." 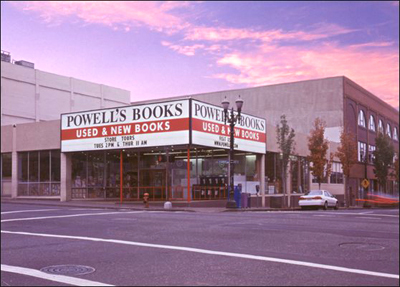 Powell's City of Books continues to thrive, decades after its first expansion into a former auto showroom, having reached cyberspace in 1994, before its online competitor Amazon.com. The neighborhoods in this tiny town of letters are nine color-coded theme rooms connected by an Escher-like network of wide stairwells, encompassing all four floors of a city block, and providing a 77,000 square feet wonderland for learning, shopping and browsing. Its avenues and alleys are formed by row after row of shelving, filled top to bottom with books in just about every language and covering virtually every subject, from "African-American Studies" to "Zines and Independent Publishing." A map is conveniently provided at the information desks located in every room. In a reader's paradise like this, it is easy to see how a visitor can become lost among the stacks, or in a fascinating conversation with one of over 200 professional bibliophiles who make up the staff. These are the administrators of this living city, caring and wise: Powell's employees not only love books, they really know books. Over the last three decades, the City of Books has become a Portland attraction in its own right, with a stop on the streetcar route only steps away from the main entrance, featuring a variety of amenities, including a parking garage, a lively café, an art gallery, and even organized tours. Offering a selection of more than a million books, this is no ordinary store; it buzzes daily with academics, cooks and poets... and that is just the employees. Powell's plays host throughout the year to book readings and signings by writers from all over the world, but the weddings, funerals and first dates that also take place here are what truly make this bookstore unique. Whether it is a used copy of Don Quixote for a student, a true treasure from the plush Rare Book Room, or an old friend in the travel section, wonders await around every corner, just as they would in a museum or an exotic village. The store has also earned its place in Portland's collective consciousness as a symbol of the city do-it-yourself spirit. "The idea that there is a mad fellow here who bought up an entire city block and filled it with books," says Marshall. "It's a 'if you build it, they will come' kind of thing: somebody realized their dream… we hear so many stories like this where [the hero does not succeed] so we celebrate it heartily when it happens." Even the expression, "a place where you could spend an eternity" takes a literal meaning here: rumor has it the remaining ashes of a devoted fan of letters rest within the City of Books. When asked, a smiling employee confirmed the truth of this lesser-known legend, though she admitted that she didn't "know where in the store they are... [nor] who it is." Thus this town is near-complete with its own cemetery to scale. Although this miniature metropolis does not have its own airport, it does have an "embassy" inside the Portland International Airport. Powell's Books at PDX and six other outlets located throughout the metro area complete the Powell's Books family, with specialty stores for gardening, home renovation, and advanced sciences, for a grand total of over 4 million books, all available through the website. Spacious and friendly, the City of Books truly has something for everyone: shelter on a drizzly afternoon, the perfect present for a beloved bookworm, or lively conversation over a cup of coffee. Much more than a store, this is a reader's Mecca: every booklover should visit at least once. What to bring: Reading glasses if necessary. Because of the size and many interesting features, allow for plenty of time to browse and shop. Food and beverages are available in the café. From Interstate 5 traveling south (from Seattle or Vancouver): Take I-405 south and cross the river. Exit at Everett Street (this will be your first exit after crossing the river). Turn left on Everett (your first legal left after exiting the highway) and continue to 9th Ave. Turn right on 9th. Travel 2 blocks to Couch Street; turn right on Couch. The City of Books awaits you on the left, occupying the entire block between 10th and 11th. To use Powell's customer parking, take a left at 11th – you'll find the entrance to our parking garage halfway along the block on your left. Interstate 5 traveling north (from Salem): Take I-405 north. Exit at Everett Street. Be careful merging with traffic to your right! Turn right on Everett Street (your first right after exiting the highway). Turn right on 9th. Travel 2 blocks to Couch Street; turn right on Couch. The City of Books awaits you on the left, occupying the entire block between 10th and 11th. To use Powell's customer parking, take a left at 11th – you'll find the entrance to our parking garage halfway along the block on your left. Highway 26 traveling east (from Beaverton): Get in the left lane as you exit the tunnel and see the city. Take the I-405 exit, which will be the fork on the left. Exit at Everett Street. You can stay in the same lane you exited on. Turn right on Everett Street (your first right after exiting the highway). Turn right on 9th. Travel 2 blocks to Couch Street; turn right on Couch. The City of Books awaits you on the left, occupying the entire block between 10th and 11th. To use Powell's customer parking, take a left at 11th – you'll find the entrance to our parking garage halfway along the block on your left. From Interstate 84 traveling either direction: The "City Center" exit carries you across the Morrison Bridge. The bridge's west side drops you on Washington Street. Continue to 10th Ave. and turn right. Continue six blocks to Burnside Street. Powell's City of Books awaits you on the north corner of Burnside and 10th. To use our parking garage, continue across Burnside Street, take your first left (on Couch Street), then another quick left onto 11th. You'll find the entrance to our parking garage halfway along the block on your left.